LIVunLtd is proud to support New York City Relief by collecting travel-sized toiletry items for Homeless Hygiene Kits, from November 26 through January 6. There are over 60,000 people in New York City homeless shelters, and that does not include those that are living on the streets. Homelessness is at an all-time high; the highest levels in NYC since the Great Depression. Each week, New York City Relief gives away approximately 650 hygiene kits to those in need. Get involved! Participate by donating one (or more) of the items listed below. All donation items must be new, travel-sized, quality, name-branded products. Please send donations to LIVunLtd Headquarters location in NYC, to the attention of Brianna Hoffman. Please call our office for more information (212) 784-2390. American Pool and Continental Pools Team Up for a Sock Drive for the Homeless! This year, all of the teams from American Pool and Continental Pools in Maryland are working together to help provide the #1 needed item for homeless across the country – Socks! We will be donating all of the socks we collect to the Joy of Sox Organization: Mission: To give joy to the homeless by giving them new socks. Vision: To be able to give new socks to all the homeless in the United States a few times a year. Impact: Over 245,000+ of new socks distributed to the homeless as of July, 1st,2017; Almost a quarter of a million pairs! All donations must be new socks, not used. Message to Sister Companies: Feel free to bring donations to any of our management offices! As part of the 2018 FirstService California Annual Meeting, associates gathered in Irvine, California to celebrate the growth and accomplishments achieved in 2017 by the region’s approximate 1,000 Associates. 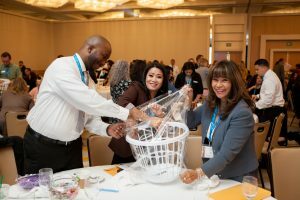 Attendees participated in a fun outreach activity which involved building 50 care packages for families who have been displaced by fires, homelessness or emergency situations. The activity was fitting in that it reflected the theme of the day: Our Future Starts with Us. We work in teams, made up of individuals, who are making a difference in the lives of each other, our company, our clients, and the communities and residents that we serve. 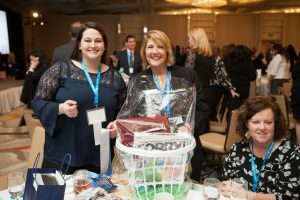 Each regional team was responsible for bringing one of ten items that were included in the Welcome Home Baskets (candles, board games, decorative item, broom/dust pan, first aid kit, etc). Over 235,000 Canadians experience homelessness in a year, including over 5,000 in Toronto alone (Toronto has the 2nd highest homeless population of any Canadian city). Approximately 1,350 chronically homeless people die each year in Canada, with an average life expectancy of 39.
by providing health supports, referrals to shelters, and essential supplies, we can meet the basic physical needs of homeless or under-housed individuals, and we can ensure their safety. by providing consistent, frequent, and compassionate service, we can decrease social isolation, and build trusting relationships that provide the emotional support needed to create change. by engaging and educating volunteers, we can raise consciousness about homelessness, reduce the stigmatization of the homeless, and inspire people to seek solutions to end homelessness. If anybody in the Toronto area ever wants to get involved with this great program, feel free to learn more here.